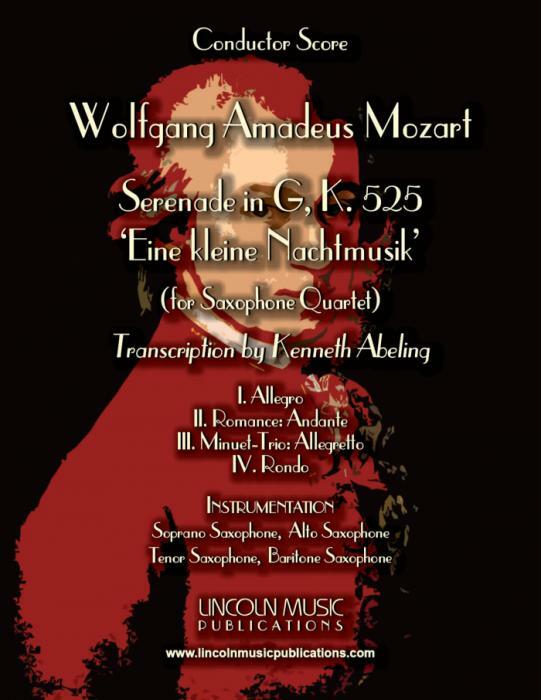 Mozart's universally known Serenade in G, K. 525 'Eine kleine Nachtmusik' or, a little night music for Saxophone Quartet by Kenneth Abeling. The movements are: I. Allegro, II. Romance: Andante, III. Minuet-Trio: Allegretto and IV. Rondo. This is an advanced level selection and appropriate for many performance applications either in its entirety or singular movements. Playing Time: 17:15 with repeats, 15:45 without.